A tree regarded as the icon of the African savannah is dying in mysterious circumstances. International scientists have discovered that most of the oldest and largest African baobabs have died over the past 12 years. They suspect the demise may be linked to climate change, although they have no direct evidence of this. The tree can grow to an enormous size, and may live hundreds if not thousands of years. The researchers, from universities in South Africa, Romania and the US, say the loss of the trees is “an event of an unprecedented magnitude”. Revealing the findings in the journal, Nature Plants, they say the deaths were not caused by an epidemic. 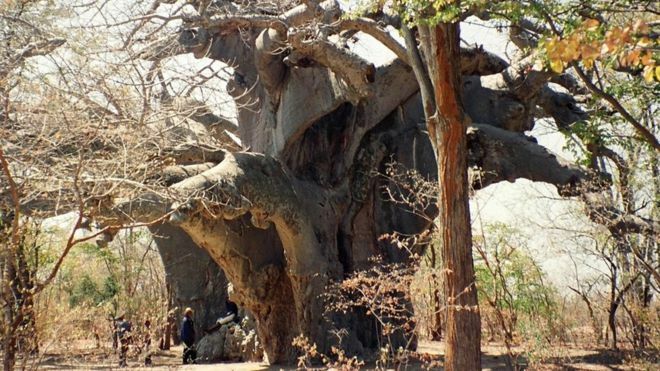 The researchers have been visiting ancient trees across southern Africa since 2005, using radio carbon dating to investigate their structure and age. Unexpectedly, they found that eight of the 13 oldest and five of the six largest baobabs had either completely died or had their oldest parts collapse. Baobab trees have many stems and trunks, often of different ages. In some cases all the stems died suddenly. The trees that have died or are dying are found in Zimbabwe, Namibia, South Africa, Botswana and Zambia. They are all between 1,000 and more than 2,500 years old. Also known as ‘dead-rat’ trees, after the shape of their fruit, baobab trees have stout, branchless trunks. They store large quantities of water inside their trunks to endure the harsh conditions of the arid areas in which they live. The trees also support wildlife, and are important nesting sites for birds.